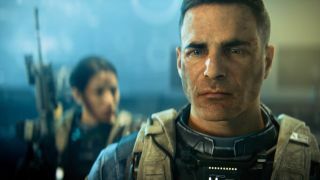 Call of Duty: Infinite Warfare and Call of Duty: Modern Warfare Remastered are both full-sized games despite being sold together, and they're going to feel like it on your storage device. Images of the box for Call of Duty: Infinite Warfare Remastered Legacy Edition (Modern Warfare Remastered doesn't come with the standard edition) posted by Charlie Intel indicate that the total install size will be a beefy 130 GB on PS4. That's the French version, so the sizes might vary slightly for different regions. We haven't seen the install size for Xbox One yet - it could be a bit different, since Microsoft's console is more flexible about installing multiple unique games from a single disc. Hopefully Legacy edition owners have the option to just install one or the other, since 130 GB is more than a quarter of the size of the common 500GB hard drive. That's a whole lot of Duty. Storage concerns aside, PS4 players can start working through the spruced-up Modern Warfare campaign right now if they pre-order the game. Here's how to play Call of Duty: Modern Warfare remastered early.